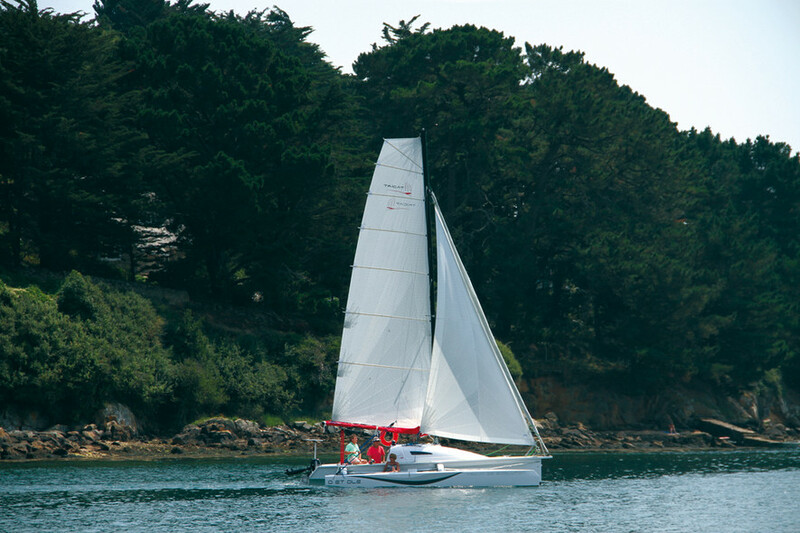 Tricat 25 Evolution It sails fast and it’s easy! The Tricat 25 Evolution is boosted by more voluminous floats and an increased sail area. Designed from the basis of the already very successful Tricat 25, the builder has, since last summer, been offering a version which is more refined, faster and...yet no more expensive, the Tricat 25 Evolution. Create a notification for "Discovery test"
Yes, but what’s new? We find more volume in the floats, whose bows are now bevelled and inverted, crossbeams in composite, replacing the aluminum tubes – here advantage is taken of the expertise gained with the 30 – and a little more windward sail area. The mainsail’s square head is increased by 0.5m² and the genoa gains three times more. The spinnaker is also bigger. Enough modifications to put the Tricat 25 Evolution back in the game, by boosting its performance faced with the competition. This restyling exercise will inevitably give it a second career from a commercial point of view: the builder has actually succeeded in maintaining the former price. To date, 28 examples of the 1st generation 25 have been sold, and the good news for their owners is that the sails, floats and crossbeams from the Evolution can be fitted to this first version of the new 25. This model’s strong point is certainly its versatility. More sober than the 22, but also much more liveable, it retains great ease of transport, thanks to its folding floats. How does this work? The arms are held in place by two straps, one fixed and one free to move. The tackle which tightens the shrouds is first freed, then the moving strap’s jammer (equipped with a safety system) is opened. The forward netting is removed. Then a line is attached to the angle formed between the aft arm and the float, and pulled towards the stern. The arms are mounted on an axle and a hinge; the float comes to rest against the central hull. Folding time: less than five minutes each side. Finally, the boat in its folded configuration is 1.2m longer at 8.9m – to be allowed for, for the marina berth and transport. This configuration protects the rudder and the motor, but access to prepare for maneuvers is not easy. During the operation, the floats sink by 3cm, which optimizes the stability. We thus go from 70 liters submerged for each float, to 120. Particularly pleasant to helm, this little trimaran accelerates in the lightest of airs. An airplane, from a force 2!